The Excalibur was a British light airborne tank destroyer designed at the School of Tank Technology in the 1960’s. The project called for a machine that weighed not more than 30 tons, was able to fit inside a Royal Air Force (RAF) Blackburn B-101 Beverley heavy transport aircraft and was fully amphibious. The vehicle was to have excellent mobility, mount a weapon capable of destroying any Soviet tank of the period and offer as low a profile as possible. During this period, the primary threat to NATO was the Warsaw Pact (composed of the USSR and its satellites) and, more importantly, it’s vast tank formations which were massed along the East German border. Many vehicles studied or designed in the School of Tank Technology during the 1960s focused on manoeuvre and destroy tactics with rapid reaction airborne vehicles being sought after to plug the expected Soviet breakout tactics. 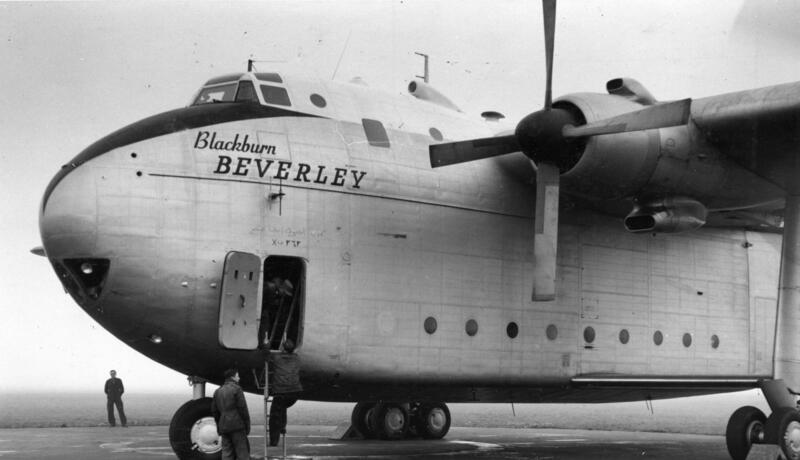 Blackburn B-101 Beverley heavy transport aircraft. The Excalibur was meant to fit inside it. This vehicle is named after the legendary sword of the mythical English King, Arthur. It was the sword the King “pulled from the stone”, although different versions of the Arthurian Legend say it was given to him by The Lady of the Lake. The legend has it that after the death of the mythical King, it was thrown back into to the Lake from where it came, with the Lady retrieving it. To this end, the designers chose to go with a quite unusual configuration. Rather than choose the standard casemated layout that many opted for in this time period, the engineers chose to mount a semi-rotating turret on the front of the tank chassis to allow for maximum gun traverse whilst keeping a relatively low profile. This design overcame several core problems with casemated designs, notably their weakness to immobilizing factors. Casemated or turretless tanks with the gun mounted in a frontal superstructure rely on their tracks to pivot and make adjustments before firing. Any damage or terrain that prevents this effectively neutralises the vehicle’s offensive ability as their gun traverse is often very poor once immobile. By having a front mounted turret with 45° arc of fire to either side, the Excalibur overcame this problem as it no longer needed to rely on hull adjustments to bring its weapons to bear and this, in turn, would help to lower its overall signature and thus increase it survivability. In order to keep combat weight down to meet the criteria of fitting and being transported in the Beverley aircraft, the developers went with a light aluminium armor layout. The hull front and turret superstructure were 50 mm of well-angled armor tapering down to 40mm on the lower front plate. The superstructure is 25 mm and 15 mm at the rear. The sides of the vehicle have several stowage boxes built in and a 5 mm separate backing plate remained behind this spaced plate. Aluminium armor was chosen as it is light enough for making airborne tanks but strong enough to stop what was required in the design specs, notably artillery fragments and machine gun fire. The notion of having a light vehicle with RHA levels of armor to stop APDS rounds and guided missiles of the period was out of the question. Excalibur survivability would come from agility and ambush tactics. 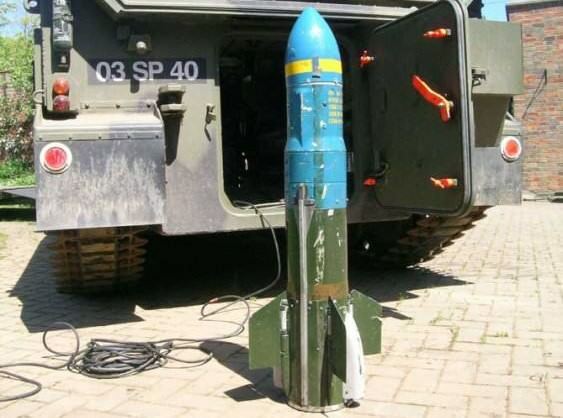 Several weapons were considered in the design but a 105 mm low-pressure gun was chosen. Low-pressure weapons were built to fit onto platforms or chassis that require a large caliber but cannot handle the high recoil pressures or have space for a long recoil. Whilst not ideally used for conventional Kinetic Energy rounds, they work very well with HEAT (High Explosive Anti-Tank) and HESH (High Explosive Squash Head) rounds that require lower velocities on impacting to work effectively. In fact, due to the way they work, the rounds are often better than the high-pressure version as they require less casing meaning increased HE filler. Low-pressure guns do require the gunner to compensate the large drop of the shell over larger distances in order to hit far-away targets. The range of such a weapon is also significantly smaller than that of a high-pressure gun. Although recoilless rifles have similar performance to low-pressure guns in terms of velocity, they are unsuitable for any vehicle with an enclosed space, such as Excalibur. Close protection was provided by a pintle mounted heavy machine gun and a coaxial pair consisting of a 0.5 (12.7 mm) and a 0.3 (7.62 mm) machine guns. Despite the front mounted weapons, the center of gravity was fairly good and the weight at the nose end not excessive due to the use of aluminium armor and the fact that low-pressure guns are much lighter than their high-velocity counterparts. Swingfire missile. The Excalibur was meant to be able to mount eight such missiles for AT duties. Excalibur could also come fitted with Swingfire missiles in the main body. If required, these would be in a series of bins mounted in the boxy body above the tracks. With Swingfire’s ability to change its course by 90° in the first second of firing (something no other ATGM has been able to emulate), it would allow the Excalibur to fire from a defiladed position (behind a hill or ridge exposing little if any of the vehicle) knocking out any tank with its 800 mm of penetration but these fittings were an optional extra. A later series of designs drawn up to a General Staff Operational Requirement (GSOR 1006) had the Swingfires mounted in several positions including along the sides and top racks. Other guns were also considered, from 76.2 mm pieces with drum fed magazines and long HV 105 mm or even 120 mm weapons. Power was provided by a Leyland L50 multi fuel two stroke 580 bhp engine that ran on diesel or MT80 petrol delivering a top road speed of 48 mph (77 km/h) via an Allison XTG 411-3 automatic transmission with a road range of 318 miles (611.5 km). Suspension was torsion type and the running gear consisted of 5 pairs of double road wheels with the 22 inch (55.8 cm) rubber, brushed steel tracks supported by four return rollers. The engine also had one more feature; it had a built-in waterjet system. This allowed the Excalibur to cross large bodies of water relatively quickly as the whole system required no preparation being inherently amphibious. The crew of three were all based in the turret at the front, the commander and gunner to the right and loader/radio operator to the left. The gunner doubled up as the driver as the Excalibur was never designed to shoot on the move and the whole system could be switched from gunner to mobility mode at the flick of a switch. The Excalibur itself was never built however the GSOR 1006 project did see the plans dusted off and further designs drawn up for a service vehicle. However, this too never entered service. 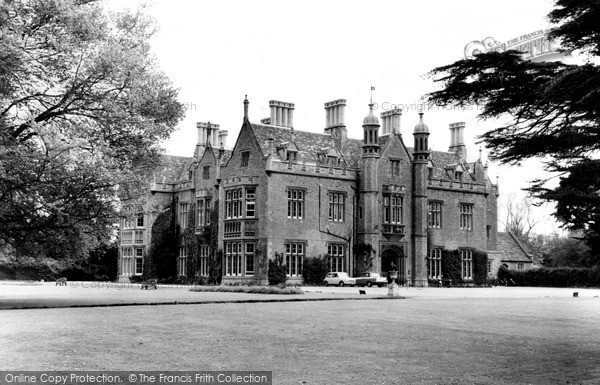 Shrivenham, one of the places where the School of Tank Technology was based. The Excalibur Light Tank Destroyer. The unusual front turret is clearly visible. Illustrated by Bernard “Escodrion” Baker. Illustration paid for thanks to Patreon donations. Have you any information on the 105mm low pressure gun that was to be fitted? A remarkable vehicle. A shame the design never reached prototype stage or later on the battlefield. It seems that nearly every specialised Cold War Armoured vehicle is omitted in service … Today All you need is a trusty chasis in which nearly any weapon system can be created, Thanks Guys. Should be 2 ‘m’s in ‘immobile’. Thx for low-pressure gun info.